Unlike benchrest shooters, hunters need to be able to make shots with significant up-angles or down-angles. That whitetail buck may be poised on a ridgetop above you, or in a valley below. When making an angled shot, the hunter faces a complex ballistic solution. This is because the angle of the shot alters the effective ballistic distance to the target. Whether you shoot up-angle or down-angle, you must adjust your elevation “clicks” as if you are shooting a shorter distance. See the diagram below. The drop of your bullet is a function of gravity, which remains constant. When you shoot at a steep angle, the actual bullet travel over the ground will be less than the sloped distance to your target. But how do you determine the flat-line or “gravity-corrected distance”? There’s a simple tool that will do the job: the patented Angle Cosine Indicator (ACI®) invented by U.S. Army Veteran Ward Brien. 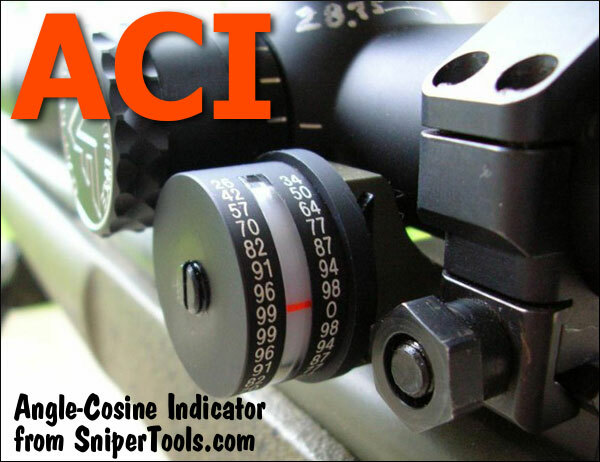 When you aim your rifle at an angle, the ACI shows the cosine value of your intended shot by means of a highly visible index mark. You simply multiply the true, sloped distance to your target by the cosine value (as a percentage), to get the corrected, flat line distance to target, i.e. the bottom leg of the triangle. Then set your scope’s elevation accordingly. For example, if you range the line of sight distance to your target at 400 yards, and the ACI shows a cosine value of 0.87 (for 30 degrees), then your flat-line “gravity-corrected distance” is 400 x 0.87 = 348 yards. Now Dial your elevation for 350 yards (from your come-up table). This simple multiplication method works well for typical 100-300 yard hunting distances, but it’s not perfect. For longer-range shots, out to 1000 yards, some other factors come into play. The most accurate method for long ranges is to input the cosine number into ballistic software, such as Exbal Ballistic Targeting Software, that runs on a PDA or smart phone. The software takes into account the fact that, during an angled shot, the bullet must still travel the full distance to target, and will have a longer time of flight than when covering the flat line distance. At very long ranges there can be as much as eight (8) MOA difference between the simple multiplication method and the solution generated by the ballistic software. NOTE: ACI Inventor Ward Brien has posted a Comment to this article which explains in greater detail why inputting the ACI value into a ballistics program is the “preferred method”. The Angle Cosine Indicator costs $145.95 from Sniper Tools. The ACI is made from aircraft grade aluminum, anodized flat black. Angles are laser-engraved onto the body in five (5) degree increments. The lens is water-resistant, shatter-proof, and shock-proof. Completely mechanical, there are no batteries or electronics to fail. For more info, visit SniperTools.com, or call (818) 359-0512. 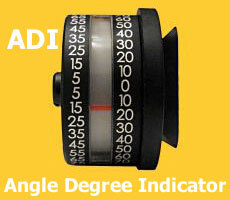 SniperTools.com also offers an Angle Degree Indicator (ADI) for $114.95 (Civilian model). This shows the actual angle from horizontal. 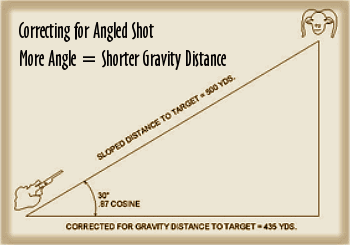 If you have a mobile ballistics solver, you can simply input the angle and the ranged yardage and the solver will provide the flatline “gravity-corrected Distance”. Some shooters find it easier to think in terms of the actual angle deflection from horizontal. There are several ways to mount an ADI or ACI. We prefer a 90° slotted mount attached to a Picatinny rail. SniperTools.com sells a Badger Ordnance ACI/ADI Rail Mount for $60.00. 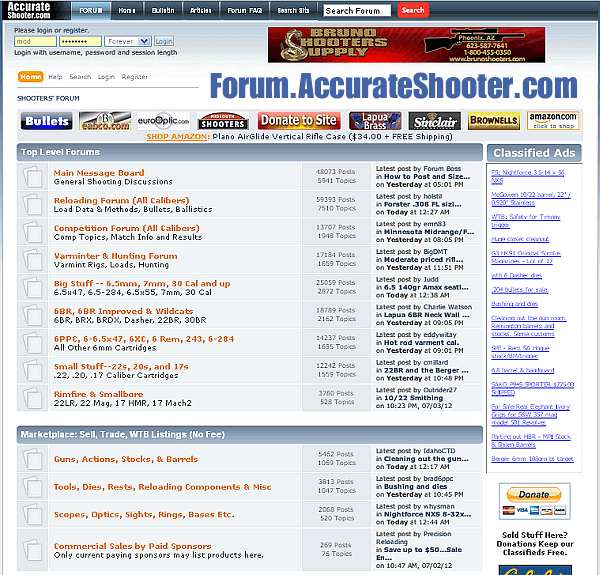 Share the post "Angle Cosine Indicator (ADI) Aids Hunters"